^ Thank you Sid, for backing me up there ! I agree, that website does sell a load of junk! Unless it's something to do with model railways, then I'm not interested in it, one little bit! the image dosen't appear, jbrock27... . It could just be that I'm viewing it on my tablet or something. I don't know. Maybe you are clicking on something you have bookmarked instead, by accident? Doesn't work for me either......the link takes me to Bradford's Canadian site. Have no idea what the explanation for you is, LOL!! ^ No, I'm am not jbrock27. I am clicking on the link that manofthesea posted. That's what it comes up with. I never bookmark any websites and if I did, I wouldn't bookmark a website like that. I've never been on that website before in my life anyway! I wouldn't want too! How about this link? It should be the Bradford Exchange's train page. ^^ That still lands me on the homepage, Flare, of The Bradford Exchange website! 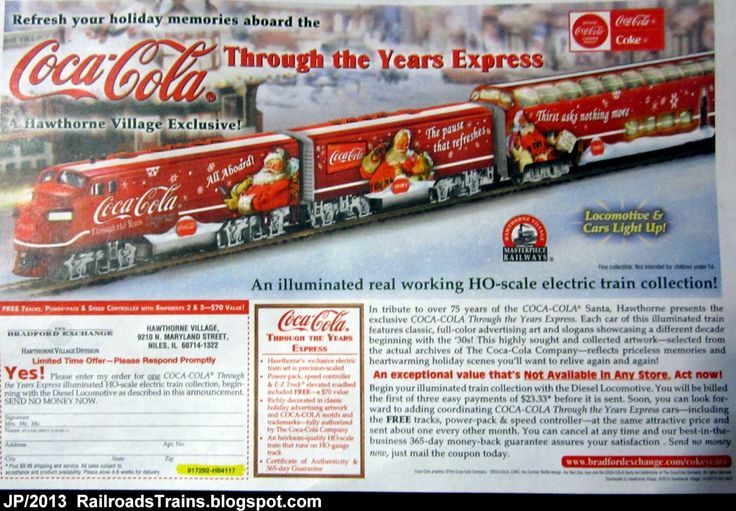 ^ I'm glad you know how I feel, jrbrock27, that I can't see the image of this Coca-Cola Train Set! Please, just somebody post the image on a comment! This links to this website for this image, just don't work at all! ^^ That works ! Is it the first image I should look at, that being an image from an eBay listing, belonging to somebody? ^ Looks like Bachmann have done a few Coca-Cola Train Sets, over the year's. I prefer the image on the first link you posted, Flare. Does anybody know if Bachmann have ever released a Pepsi, Tango, 7up or any other fizzy drinks branded train set/'s? For whatever reason, the original link worked fine for me. Took me straight to the Coca-Cola train. I'm using Firefox 50.1.0 for what it's worth. ^ Not for me it didn't, Len! I have clicked on the same link on laptop (Which I posted this comment on) and my tablet un-countable times now and it has never come up with the Coca-Cola Train Set image once! I rest my case! Anyway, with all of this talk about Coca-Cola Train Set's, I could just do with a nice cold glass or bottle, of Coca-Cola! Original link works fine for me too. That's using an iPad and Safari to view it.